Last week, April 20-24, was April vacation week for those of us who are K-12 teachers or students here in Western Massachusetts. I am in the former category. My flax aspirations for the week were astronomically high. I am happy to say that I came very close to meeting my aspirations, and it was utterly thrilling. I did research and learned a lot of new things (which I will write about later). I dug in the soil with a pitchfork, used a rake, a shovel, and a hoe. I planted and watered seeds. These are many of my favorite things, so it was pretty much a perfect week. On Sunday April 19th I decided to start some of my Japanese indigo seeds. You may recall that I was able to save a substantial quantity last fall. I ought to have started them weeks ago, perhaps even months ago. However, earlier in the spring it was hard to believe that the snow would ever melt so I just couldn’t handle seed starting. This past weekend, it was gloriously warm and it was clear that spring had triumphed at last. So, I figured it was better late than never. I borrowed a teeny cold frame from school, which has been sitting in the basement over there for years. It needed a little washing and reinforcing. I used our very own compost mixed with potting soil, planted seeds in little six-packs, watered them, and set them in the warm sun. 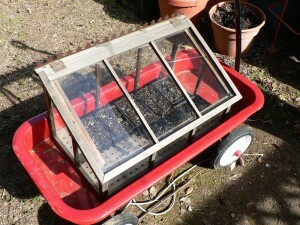 The cold frame is on the wagon is so we can move it around to keep it in the sun, and bring it indoors easily at night.